Most dentistry looks like dentistry. Our goal is to provide dentistry that is undetectable. We are renowned for our quality of work and the outstanding results we are able to achieve. We replace existing crowns and fillings with restorations that look and feel like your own natural teeth. It is not unusual for our dental restorations to last 20-30 years because we use reliable state-of-the-art techniques and high-grade materials – this is as permanent as dental treatment can get. Fitting a crown requires at least two visits to our office. Initially we will remove all any decay, shape the remaining tooth structure and then fit you with a temporary crown of either plastic or metal. On the subsequent visit we will remove the temporary crown, try on the new crown and adjust if necessary. 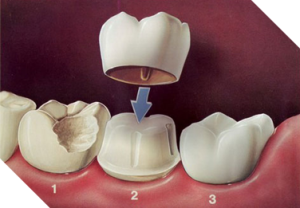 Finally we will cement the permanent crown in place so you have a new, beautiful, natural-looking tooth. Crowns (and bridges) are very reliable long-term solutions for major dental problems caused by accident, disease or wear and tear. High-grade porcelain or porcelain bonded to gold are excellent choices where damage has caused loss of teeth, teeth have broken from excessive stress/wear or old fillings have deteriorated so much that replacing them is no longer an option. Placing crowns on back (molar) teeth relieves the pain many people develop from cracks due to the force of chewing and allows for a more comfortable return to full dental function. Older fillings on front teeth can both weaken and cause ‘appearance’ problems such as discoloration, staining and/or chipping. Porcelain crowns are very effective in these cases. Crowns also prevent tooth breakage and fracture of teeth that have been root canal treated. Crown techniques can correct even the most severe dental problems making your smile appear new again. All of your teeth play an important role in speaking, chewing and maintaining proper positioning of your remaining teeth. Tooth loss doesn’t necessarily always occur as you age but when you do lose teeth, they must be replaced to maintain proper alignment and avoid major jaw dysfunction and pain. Fortunately there are excellent options for correcting tooth loss.